We'll have a full review soon, but there are some things I can say from playing with the phones for a bit. You can ask any questions you want in the comments, but remember I haven't had the phones long enough to tell about things like battery life. Also, pricing and availability are under embargo. 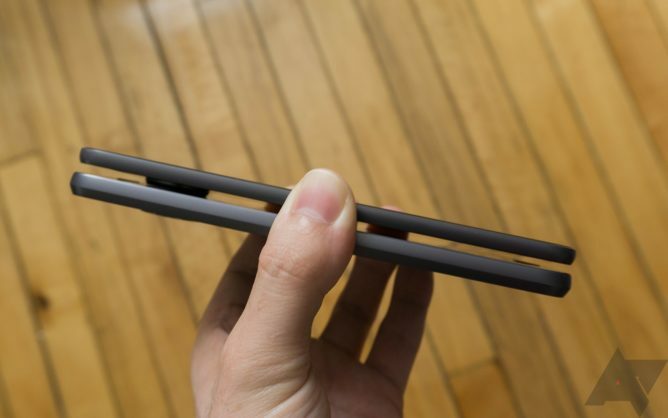 Motorola/Lenovo has been talking up the design of the Moto Z by reminding everyone how crazy-thin it is (5.2mm for the Z and 7mm for the Z Force). Picking up the Moto Z is mildly unsettling because it doesn't seem like it should be so insubstantial. It's basically just a flat slab of aluminum, which isn't the most ergonomic shape. In this case, it's so freakishly light that it doesn't matter. The Force feels more like a traditional phone in heft, but it still has the completely flat back. The back panel does collect fingerprints remarkably well for metal too. I will say the Moto Z looks nicer in person than in photos, but that's true of a lot of phones. I still don't think it's a very attractive device overall. The camera sticks so far out on the back that I feel weird setting it down. That, and the pins at the bottom of the rear give it an "unfinished" vibe. Maybe that's what Motorola is going for, though. It's unfinished, but you can finish it with Moto Mods. Please buy Moto Mods, I think is what they're saying here. When you add Mods, the phone starts bulking up considerably. 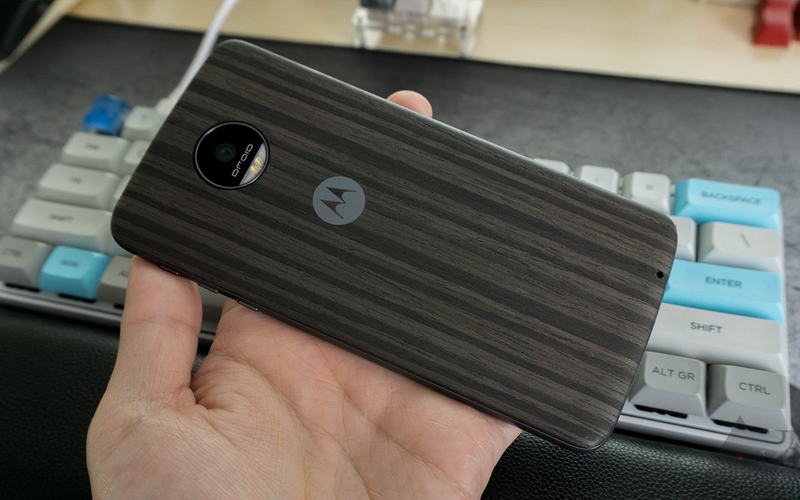 David is going to talk about the Moto Mods in more detail soon. The gist of it is that the basic style cover gives the phone a more normal shape that's easier to hold, but I would prefer the phone was just built like this to start and had a larger battery (2600mAh in the Z and 3500mAh in the Z Force). 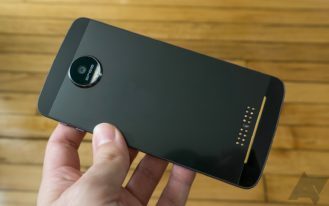 But again, Moto Mods. The other Mods seem impractical and huge. The projector in particular is hilariously big. There's a fingerprint sensor on the front of the phone beneath the screen, and I know what you're going to say. Look at that bezel. Yeah, it's big, and there's Moto branding there. This is what we've been chiding HTC about for years, and they finally stopped it with the HTC 10. 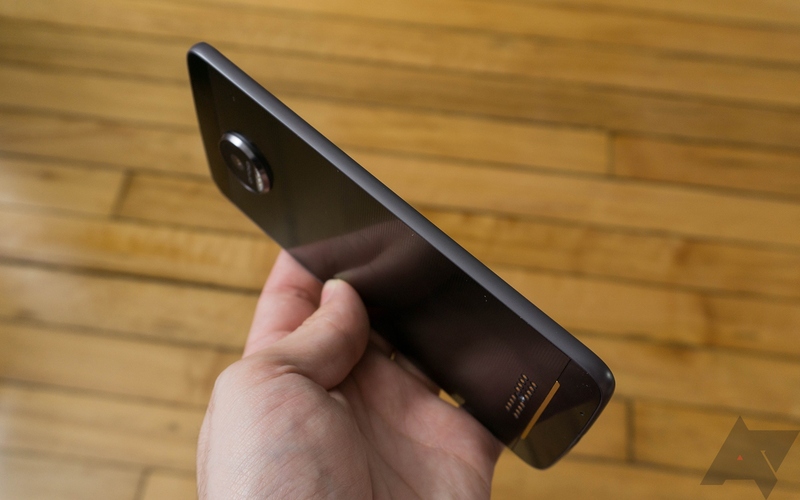 The bigger bezel on the Moto Z probably has something to do with how thin the phone is. You have to fit everything inside somehow. The fingerprint sensor seems to be very accurate and it can be used to both wake up and put the phone to sleep (long-press). It's not a home button, though. On the bottom is the Type-C port, the only one on the phone. The adapter is included for headphones, and it works passively. That's better than the alternative, but I'm still not crazy about the idea. 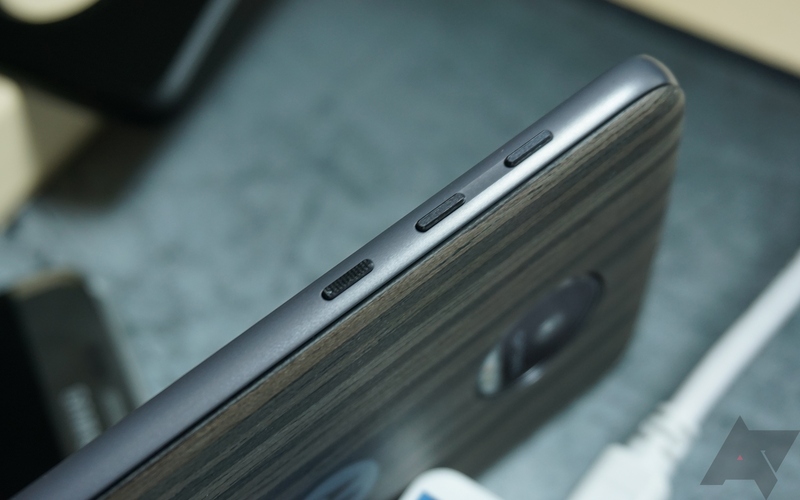 The power button and volume toggles on the right edge of the phone are tiny. Like, what are these? Buttons for ants? They are also roughly the same size and spaced identically. This was bad when HTC did it on the M9 and it's bad now. All three buttons are fairly high up on the phone, so it's not quite as annoying as the M9 was, but still far from an ideal design. The display is a 5.5-inch AMOLED panel with a resolution of 2560x1440. I don't have any strong feelings about this screen right now as I have yet to put it through its paces. The viewing angles seem good and colors look accurate at a glance. The AMOLED panel nicely complements Moto Display, which is still part of the software loadout. 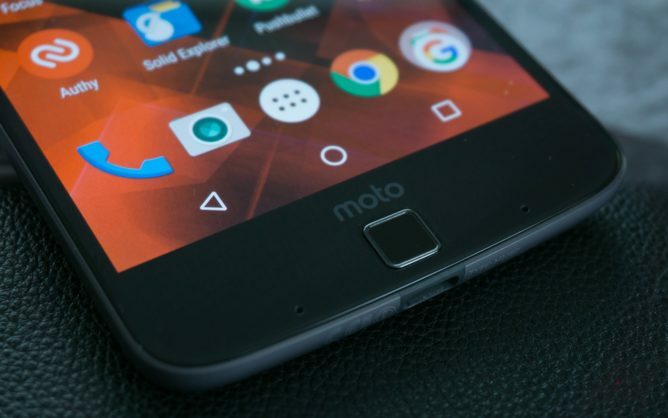 You can wave at the phone to wake up Moto Display, see notifications, and act on them. Moto Voice is still here as well with custom launch phrases, and Moto Actions lets you control the phone (eg. camera and flashlight shortcuts). I can already tell I'm going to have a very similar software complaint to one I voiced in the Moto X Pure review—Motorola's software just isn't evolving much. It doesn't seem to offer anything new, other than a handful of layout tweaks. In an odd step back, this phone ships with a basic AOSP launcher3 home screen with a few small modifications. 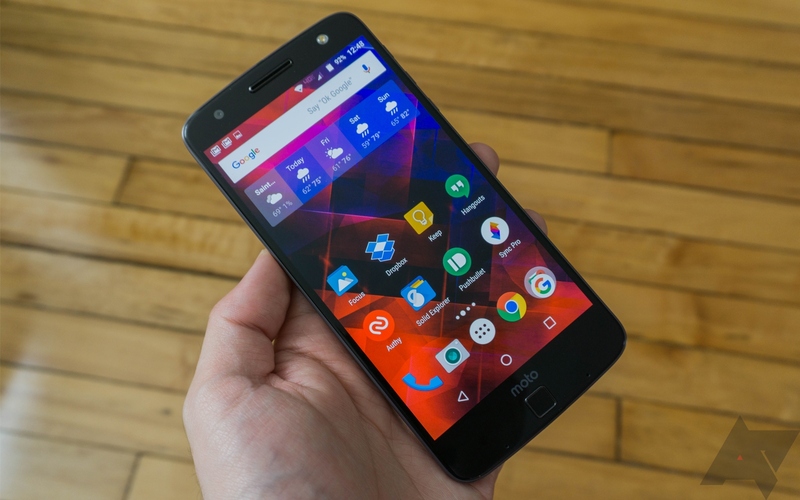 The Google Now Launcher is not the default as it was on the X and is on the new Moto G.
I'll put the Moto Z and Z Force to the test and work on a full review, but in the meantime, feel free to ask questions in the comments.